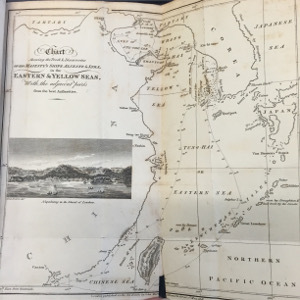 John McLeod in his ‘Voyage of His Majesty’s Ship Alceste to China, Corea, and the Island of Lewchew with an account of her shipwreck’ (3rd ed, 1820) [Reserve 915.1]. 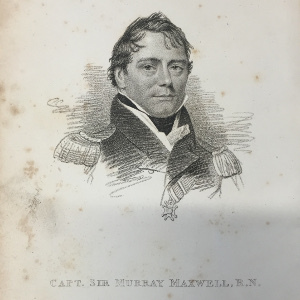 Under the command of Captain Murray Maxwell, the Alceste was one of the first British vessels to visit Okinawa Island (Lewchew), the largest of the Ryukyu Islands of Japan. The purpose of the voyage was to transport Ambassador, Lord Amherst to the court of the Chinese Emperor at Peking, in an attempt to open trade with China. The Alceste sailed in 1816, travelling via Rio de Janeiro and the Cape of Good Hope to China. Once the Ambassador and his delegation had disembarked, the Captain and crew continued on to explore the region. It seems as though the Korean people had been forbidden from welcoming strangers to their shores, for when the crew did make land, a chief they had befriended at sea,”clasped his hands in mournful silence; at last bursting into a fit of crying” then seemed to “intimate that in four days […] he should lose his head’’ and refused to welcome them beyond the beach. The crew spent several months with the island people, learning about their language, customs and traditions. McLeod reports for example on the nature of their dance: “The mode of dancing of these people may, strictly speaking, be termed hopping” but the crew did their best to join in forming “a grotesque assembly”. 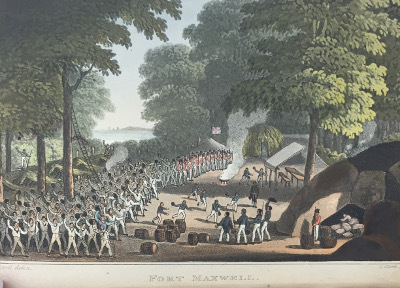 Fort Maxwell – the fort built after the Alceste was shipwrecked, named for her captain. attacked by ferocious Malay pirates but their rescue ship, the Caesar, also caught fire! The crew finally reached home in the autumn of 1817 after a journey of twenty months (Beijing Center). 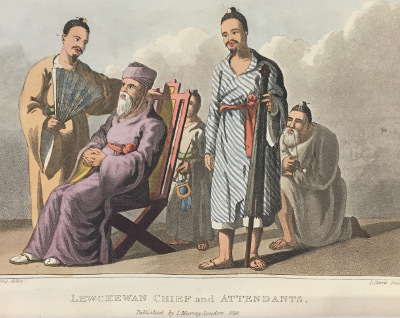 McLeod published his account of the voyage shortly after his return; a popular work, second and third editions were later released in 1819 and 1820 respectively, (Beijing Center).